A picture worth a thousand words. Capitec CEO Riaan’s Stassen’s office. 12 square metres with The Stig in the corner. A true measure of man is the way he responds to criticism. The immature, the knee-jerkers instantly lash back, often living to regret the consequence. The wise, more evolved of our species rely on reason. Changing minds by opening eyes rather than poking them out with a sharp stick. Capitec’s outgoing CEO Riaan Stassen is very much in the second camp. When we met for tea a few weeks ago, he listened carefully and quietly worked through the numbers to show where my assumptions were off-track. But for him that was only half the job. He also invited me to Stellenbosch for a no-holds-barred look under Capitec’s hood. The visit happened on Friday. It was Stassen’s last official day at Capitec Bank, and he was insistent it happen before he departed. Such is the man’s passion for the R23bn business he helped grow from scratch that Stassen gave up his final morning to talk through the operation, its history and strategy – and show me around. In the four months since Biznews.com launched, Capitec has been among our best-read subjects. The focus flowed from collective head scratching among investment analysts at a bombproof share price. Despite the unfolding disaster and subsequent stock meltdown at direct competitor African Bank, Capitec’s share price hardly faltered. Among the investment analysts calling Stassen’s stock a “guaranteed short” was a number cruncher who took me through his well-considered argument. Another, who prefers the nom de plume of Charlie Graham, wrote various pieces for Biznews publicly expressing his concerns. The rise and rise of Capitec – Stassen bought some shares in the early days at 80c. That investment multiplied 267 times. The stock is a 10 bagger for all who bought before end 2005. Even though I’m now sure those arguments were off beam, there’s no regret that we published them. Otherwise it’s unlikely there would have been sufficient motivation to look closely at this extraordinary company. It provides a story with many lessons for business scientists – especially those fascinated by Disruptors. I’ve known about Capitec for years through its association with PSG’s founder Jannie Mouton. Also via former colleague Julius Cobbett, the most astute assessor of financial products I’ve met. Jules has been a Capitec client (and very happy shareholder) since its early days. He’s never stopped preaching its virtues. Until now, I haven’t been much of a listener. Like most others who never looked closely at Capitec, it seemed, well, a micro lender with a banking licence. Friday’s trip to the Cape changed my mind. Big time. After spending the day kicking Capitec’s tyres, I can see why its investors remain steadfast. The group is not without challenges. But underlying it all beats the heart of a determined Disruptor. One with a well-defined plan that’s being brilliantly executed. Capitec is to banking what Discovery Health has been to medical aids. It is not African Bank and shouldn’t even be mentioned in the same breath. The first thing that hits any first time visitor to Capitec’s head office is authenticity. No Versailles-like gardens. No investment art. No edifice celebrating its success. Capitec rents, at R86 a square metre, a cluster of low-rise office blocks in a complex built as Stellenbosch’s technology park. Its cost consciousness runs through every pore. Although a bank, Capitec was designed and is run like a retailer. Its branches are open retail, not banking hours, including Sundays. And in the malls are located near high the traffic fashion outlets – far away as possible from banking halls where competitors congregate. Having spent a couple years in the upper reaches of a traditional bank, I got to know all about Paterson and Peromnes. These famous job grading systems seemed to be at the core of the culture, the thing every executive worried about most. So extreme was the implementation that after I left, my office was reduced in size, the walls physically moved, because someone with a lower job grade was appointed to the post. Career bankers used to grading themselves by extra square metres or additional pot plants would be horrified to see Stassen’s office. Measuring just 12 square metres, it is home to a simple L-shaped desk leaving enough space for a four-seater conference table. 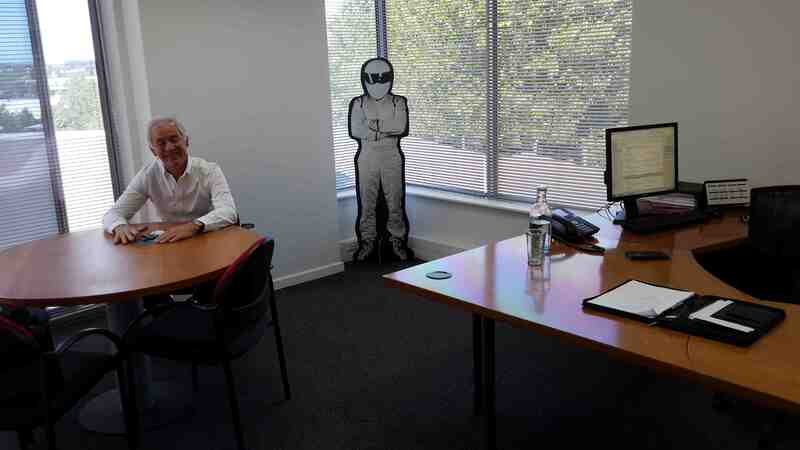 The only personal indulgence is a cardboard cutout of The Stig (he’s a Top Gear fan). Stassen, his successor Gerrie Fourie and business development head Andre Olivier share a secretary. And have done for years. Not that many career bankers will get the chance to see inside the Capitec CEO’s den. Stassen says his company stopped appointing staff from other banks years ago. It hires almost exclusively from the retail sector. Growing its own trees by recruiting in the 23 to 28 age bracket. He says the HR Department’s primary purpose is sifting through 36 000 job applications a year and performing “a battery of tests” to select the 150 new employees hired every month. Of every 100 applications for the rural branches, only four will be appointed. The ratio in the cities is one in ten. Stassen told me he got the idea of Capitec after being recruited into the disaster that was the old Boland Bank. A chartered accountant, he had been running logistics and distribution at liquor group Distell. His boss Michiel le Roux was tapped by entrepreneur Christo Wiese to run his newly acquired bank and asked Stassen to join him. The way Stassen tells it, Wiese is a dealmaker supreme. But in Boland Bank’s case, hadn’t paid enough attention to what he was actually buying. Boland was “a tiny ABSA”, without the scale or structures. It looked to be doomed. Le Roux and Stassen brought fresh eyes to the failing business. Decided to make it paperless, transparent, real-time. And learn from retailers by changing to a low cost, customer-only focused branch network supported by a centralised “distribution centre” hub for the call centre and back office. Before their job was even half done, Wiese engineered a merger between his recovering Boland and former building society NBS. An error was compounded shortly thereafter by imposing that dysfunctional marriage onto Cape money manager BOE. Stassen’s aversion for corporate politics stems from that unhappy period. Le Roux subsequently fell out with Wiese and left. Not long afterwards BOE and its satellites ended up in Nedbank. But the financial services bug had bitten Le Roux. He linked up with PSG founder Mouton who had been attracted by high margins generated by unregulated and therefore highly profitable cash loan shops. They saw an opportunity to consolidate the fragmented industry and built a 307 strong network of these 30% interest a month micro-lenders operating mostly from dingy backstreets or old high rises. They called it Finaid. Meanwhile Stassen and his team were at the same school, developing half a dozen Pep Bank branches – piggy-backed off Wiese’s clothing retail group. Eventually Le Roux came calling and Stassen admits it didn’t take much encouragement for him and his team to ditch the highly politicized BOE/Boland/NBS operation. That was in the year 2000. The rest is history. Mouton injected R250m in startup capital. His 28.5% stake is now worth R6.6bn. Lessons from those “unbelievably difficult” early years were well learnt. Its exposure to the unsavoury cash loan business is long gone. Slowly the Finaid stores were closed or converted. The one-month, R10 000 max cash loan operation is a distant memory. Capitec’s loans now run to 84 months and attract interest rates of between 17% and 28% per annum – identical to credit cards. Its low charges have delivering mushrooming volumes that produced transaction fees of R1.4bn in the last financial year, up 61%. Stassen has created the biggest Disruptor that SA banking has ever seen. More importantly, its cost to income ratio is 38% in a sector where anything around 50% is regarded as highly efficient. Capitec now has 5m clients, recently surpassed Nedbank in retail market share. How hard was it to hand over the reins? Stassen is slim, fit, energetic and intensely passionate about Capitec. He is a youthful just turned 60. And long ago accumulated enough wealth not to fret ahead of payday. But told me that after 13 years at the helm, he believes it is time long-time colleague Gerrie Fourie got to run the shop. Opening 60 branches a year requires a lot of energy. And Stassen says he is looking forward to taking it easy for a few months. But he is convinced the Capitec model will travel. Especially into developed countries where banking cultures and the industry structure is similar to SA’s. His brother has “connections” in Europe he’d like to tap into. One day. For now, Stassen is content to have a few months off. To catch his breath and watch those missed episodes of Top Gear. But he’ll be back. Refreshed and ready to literally take on the world. I’d give it a year, tops. Stassen’s mission isn’t over. Not by a long way.